They manage limited resources while conducting research and working to avoid personal conflicts. Communication is delayed the 20 minutes, the length it would take to relay messages from Mars. 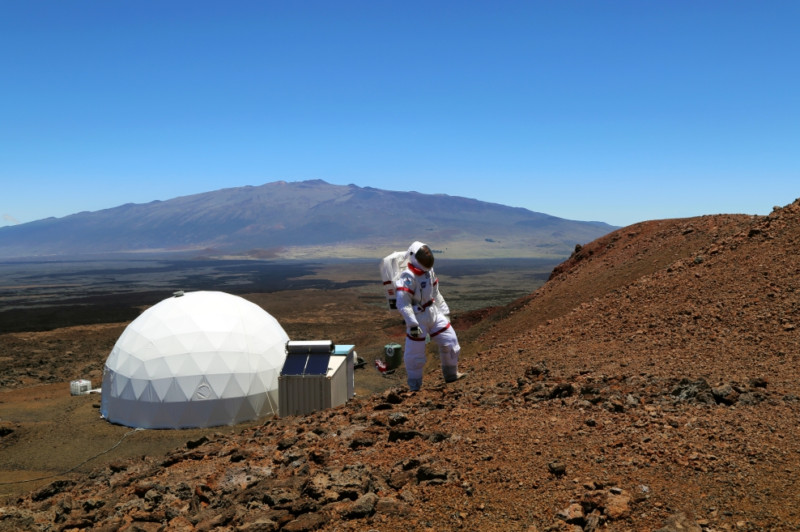 Kim Binsted, principal investigator for the Hawaii Space Exploration Analog and Simulation, said this simulation is the second-longest of its kind after a mission that lasted 520 days in Russia. "They're doing OK as far as we can tell," Binsted said of the scientists. Previous simulations in the Mauna Loa dome have lasted four to eight months. Mauna Loa soil is similar to what would be found on Mars. The area's high elevation means almost no plant growth. NASA funded the study run through the University of Hawaii. The scientists will have access to fresh produce and other foods not available to them in the dome when the simulation ends Aug. 28. "They are clamoring to get into the ocean," Binsted said. "I think they will enjoy having a beer as well." An eight-month simulation starts in January.